New environment minister François de Rugy is expected to maintain France’s focus on nuclear. President Macron is backtracking on plans to cut nuclear power generation. Observers are expecting France to stay true to nuclear power at the expense of renewables following a change in environment minister this month. François de Rugy, a former Ecologist Party member, took up the post of Minister of Ecological and Solidary Transition at the beginning of September after the surprise resignation of his predecessor, Nicolas Hulot. 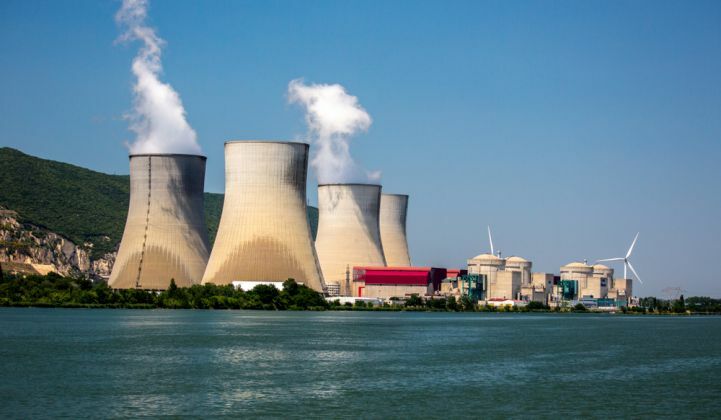 Despite de Rugy’s green credentials, the minister’s appointment was seen as a setback for plans to cut nuclear’s portion of the French energy pie in favor of renewables. One of de Rugy’s first moves following his appointment was to announce a review of France’s energy mix. The review is due to be published at the end of October. Hulot, a TV personality who came to fame by making nature documentaries, quit in August after becoming frustrated with the slow progress of environmental policies in the face of powerful French lobbies. One of Macron’s campaign pledges in the elections last year was to uphold plans to cut the share of nuclear generation in France’s electricity system to 50 percent by 2025, down from around 75 percent today, according to World Nuclear Association figures. State utility Électricité de France, which would have had to foot the bill in the event of a nuclear shutdown, saw shares climb the day after de Rugy’s appointment. The value of the company was up by almost 7 percent a fortnight later. Meanwhile, the renewable industry in France is enjoying mixed fortunes. France this month joined the race to commercialize floating offshore wind, putting a 2-megawatt demonstration machine called Floatgen into operation off the Loire-Atlantique coast. At the same time, though, the country’s latest onshore wind tender failed to secure bids for even a quarter of the capacity on offer. The tender, France’s second, saw 118 megawatts of a total 500-megawatt allocation go to five projects, owned by Boralex of Canada, Elicio of Belgium, Engie of France and Renewable Energy Systems of the U.K. The average price of the bids was not disclosed. The tender was part of plans for the procurement of 3 gigawatts of onshore wind across France. The French paper Les Echos said the failure to allocate the full capacity was partly due to a change in the tendering process, whereby bidders had to have a project approval from regional authorities before being admitted to the auction. The problem was exacerbated by the fact that permitting for new wind projects in France has been in limbo since December 2017, when courts upheld a legal challenge from an environmental group called France Nature Environment. FNE had complained that the permitting process was open to abuse, as the regional authorities providing wind farm permits were also responsible for evaluating environmental impact studies for the projects. It is unclear when the permitting issues will be resolved, casting doubt over France’s ability to raise, in the short term, the amount of electricity generation that comes from renewables. The International Energy Agency puts France's current mix at 4 percent for wind and 2 percent for solar. In a global market outlook up to 2022, the European solar association SolarPower Europe forecast France could still see gigawatt-scale capacity additions over the next four years. But in a report last year on wind energy scenarios for Europe in 2030, the industry body WindEurope said that France, along with Ireland, the Netherlands and Luxembourg, would be likely to miss its binding target for renewable energy in 2020. Recent events have done little to change that outlook.